Adam Bailey is worried. His best friend has just proposed to a woman Adam is sure he shouldn't marry and he has just six weeks to convince him otherwise, trying not ruin their friendship in the process. But as Adam spouts the virtues of a singleton status, he meets a woman that might just change his mind on the subject. I thoroughly enjoyed Best Man and snickered while lounging by the pool much to the amusement or annoyance of other sunbathers I’m sure. Regardless, I kept chuckling my way through and made a mental note to read lad lit more often. I forgot how much I enjoy it and what a nice change of pace it is from the usual chick lit stories we’re reading. I appreciated the male perspective and found getting into a man’s head interesting. It was a great story, full of insight into male friendships and why they don’t discuss ‘serious things’ often leading to hilarious outcomes. It was also amusing to read the male point of view when it comes to relationships, both his best friend’s and his own. Best Man was fast paced and easy to read. The characters were all clearly defined and I found none of them irritating (except those that were meant to) and rooted for Adam to get up the courage to have his ‘talk’ with Nick. 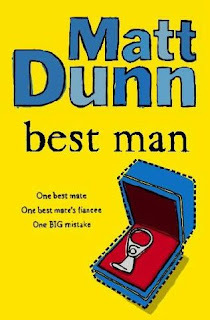 I look forward to reading another Matt Dunn novel as soon as we can get to one! I hadn’t read any lad lit in ages so Best Man was fun! Matt Dunn is definitely writing from a man’s perspective and he does a really good job of making sure you know that without you also wanting to scream and yell at his main man! The main character is Adam who is sort of drifting around relationships and isn’t at all interested in settling down to marriage. He seems to have a fear of becoming one of the married people to such an extreme that he’s critical of the woman his best friend Nick is preparing to marry. Adam thinks he needs to tell Nick he’s making a mistake but doesn’t know how to have this serious heart to heart- because he’s a man and men don’t talk about serious things apparently. Turns out he’s right about the woman but in typical male fashion he scoots around the subject for the entire novel. Best Man is funny and light with good plot. The supporting roles were still relatable and there weren’t any that just appeared with no purpose (which is good because that really annoys me!). I really liked the woman Matt Dunn created for Adam- she wasn’t ditzy or over-emotional. She was, in fact, pretty normal. Impressive to be able to create a female character that women don’t find annoying. It had just enough depth to keep me interested and I would certainly read another of his novels.